Looking for a Weekend Lodge? Try one of our Log Chalets. Weekend log chalets are normally up to 30m² total ground floor area and will in most cases not require planning permission. The designs would normally have a lounge, double bedroom, bath shower room and galley kitchen area. 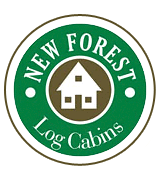 The possibilities are endless and being made from Log Clad Timber Frame or tight interlocking solid redwood pine logs are suitable for many uses including weekend accommodation, leisure room, home office, play room or as a fitness centre with fitted sauna. Weekend leisure chalets also features low profile roofs and can be fitted with window shutters for when not in use and extensive veranda areas for guests, friends and family to enjoy the character and charm of our quality log cabins. When there's no more room inside and you need extra these lodges that are made to suit the needs of the individual are designed and built to be temporary buildings and so much easier to get planning permission for and with a life expectancy of in excess of 100 years they have a lot to offer. The Boundary Lodge could be your new Weekend Home or very comfortable one bed lodge measuring 14.1mtr x 5.8mtr in 150mm oval log. The Hill Chalet is built to a very high standard in 92mm square log with full insulation to UK Building Regulations with nothing spared. This Chalet is ideal for the weekend guests or the ageing parent who you want to come live with you, but who also want the independence of their own front door. 6.1mtr x 4.8mtr built in fully insulated 92mm wall logs and great for year round living for the next 100 years. Originally designed as a Sauna House the Mardi 36 could just as easily be built as a 1 bed Weekend Lodge, or with a log burning stove as somewhere warm and cosy to spend the long winter days relaxing in a tranquil setting by the lake or nestled in the trees. 1 Bed Log Chalet 6.43 x 5.6mtr with 1.5mtr overhang and verandah - 150mm. Availble in square or round log..
7.18mtr x 5.68mtr with 1.5mtr overhang and verandah in solid 70mm logs. The Pioneer 30 comes from the Pioneer design stable, which has proved to be our most successful Home Office cabins. The floor plan and internal layout are very much custom design, which means you can have the rooms configured to suit your requirements. 7.4 x 4.2mtr with 1.5mtr overhang and verandah - 70mm.